Often I remember autumn 1997, the UEFA Champions League and especially two matches: Dynamo Kyiv against Barcelona and Barcelona against Dynamo Kyiv two weeks later. Both matches were won by Dynamo Kyiv: 3:0 in Kyiv and 0:4 in Barcelona. I’m writing about these two matches not only because Kyiv achieved 7 goals and Barcelona couldn’t make even one during 180 minutes, but because I was impressed by the way they played. As a painter I am interested in soccer, because painting and soccer have a lot of things that are sharing similar processes. In a way I see painting as an opponent. To win, the painter has to conquer and control surface, light, space and time. Just as in soccer, I’m looking for the rhythm in painting. In the book “Conversations with Cezanne”, in the chapter “Confessions” you will find a survey, a kind of questionnaire, in which Paul Cezanne had taken part in. Amongst other things, there appears the question for the ideal of earthly happiness. The painter answered: “Having a beautiful formula”. 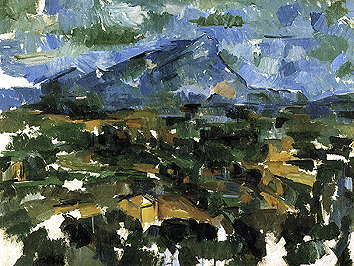 As an outstanding example for how Paul Cezanne succeeded to control time, space and light by colour and rhythm, I chose the painting from 1902-06 Mont Sainte-Victoire seen from Les Lauves, which can be seen at the Kunsthaus Zurich. Cezanne violated the space and does not worry about the foreground and background systems, he doesn’t represent any construction of light. The painting is flat. Cezanne focuses on the rhythmic colour modulation. The colour reproduces the depth and the light of the work. Cezanne puts the colour on the canvas very quickly with short brush strokes and so he adopts and controls space. The mountain, the sky and the landscape occur instantaneously. Since 2000 I deal with the works of the American musician, alto saxophonist, bandleader and composer Steve Coleman. I am fascinated in Colman’s music especially his rhythmic forms and the way how he varies these. How Lobanovskiy’s Dynamo from defense to attack or Cezanne’s painting skip from white to black, so do Steve Coleman’s bands rhythmicaly from silence to sound. In an interview, Steve Coleman said, he wanted to express the recognition of the “natural rhythms of the universe”. Steve Coleman has succeeded via complex rhythm to make one band out of two. The musicians were playing their own rhythms in different cycles. The cycles overlapped and parted again. These fluctuations were still supported by intense groove. That changed in spectacular speed from soft and slow to loud and fast. The musicians responded reflexively to the changing musical conditions without losing the balance of the band. Coleman’s rhythmic structures allows a creative improvisation, that suspends our sense of space and time.